David Brooks in an article in the New York Times (8.1.14) has suggested that both progressive and conservative programs miss the key variable which determines a rise out of poverty – character. Discipline, enterprise, awareness, and moral standards (habits, opportunity, exemplars, and standards) are the keys to individual economic progress. While intelligence and cognitive skills are essential, they alone cannot assure success. Henry Walpole was a backwoods redneck who beat his children, was drunk by early afternoon, and was only one of a long line of uneducated, inbred Scots-Irish who had lived in the hills since long before the Civil War. Every one of his neighbors was as mean-spirited, anti-social, and ignorant as he was. Theirs was a community of moral irresponsibility and social dysfunction. Walpole and his slatternly wife had no discipline to speak of. Opportunity meant only odd jobs, a still, and piece work; and the only motivation for his three children was punishment. He beat and lashed them for every minor infraction of his arbitrary rules. Walpole lived so far in the backwoods that the County Department of Human Services never even knew about him let alone be aware of his abusive behavior; and the children were already seven, eight, and ten when they were finally removed and placed in the foster home system. As might be expected, none of the children made it much farther than their father. The damage had been done. They had all been given a double-helix of defective genes, had known only meanness and punishment, had no ‘exemplars’ as Brooks calls them, to guide them on the right path, and the only moral standards they knew were inversions of the norm. It was no surprise then that Lucas Walpole was accused of burning down a schoolhouse in Eupora and incinerating five children and a teacher who had not managed to escape. By the time he committed the crime he was twenty-five, had been behind bars almost as much as he had been free, never showed any remorse for his brutality and barbarism, and was as irremediable as anyone the justice system of Dobbs County had ever seen. William Faulkner understood this pathology and wrote about the life of Joe Christmas in Light in August. Christmas had the same upbringing as Lucas Walpole – left on the doorsteps of an orphanage, referred to a foster home where the father was as brutally abusive as Henry Walpole. Christmas is not so temperate as Lucas, however, and in a rage of frustration, blind anger, and hatred, kills his foster father. Christmas wanders the territory as a young adult and takes up with a young widow who falls in love with him, attracted as many women are by his unpredictability, virility, and latent power. She misjudges him, and her kindness and ministrations are seen by Christmas as manipulative and domineering as those of his foster father. Joe burns her house down and she is killed. Eventually Christmas is caught, castrated, and beaten to death. Through Christmas’ many interior soliloquies, we learn that he is intelligent, sensitive, and perceptive; but that these characteristics have been warped by his upbringing. In the inverted world of the orphanage and the foster family, good did not exist – only selfishness and cruelty. A caretaker at the orphanage who incorrectly believes that Joe has caught her in a sexual indiscretion, conspires with a janitor to kidnap him and then abandon him in Arkansas. After he is returned to the orphanage, he is placed in the foster home of Mr. McEachern, an Old Testament zealot who can only see evil, apostasy, and rebellion against God. Christmas understands the twisted, immoral nature of McEachern, but because he has never learned self-discipline, patience, or negotiation, his only recourse is to repay violence with violence. In Joe Christmas Faulkner has created a sympathetic character. He portrays him as a man who at a visceral level feels the injustice of the world and resents the fact that he, an intelligent and willful man, can do nothing about it. There is nothing that can rehabilitate a man like Joe Christmas who has been brutalized as a youth, deprived of any positive influences, and yet ironically given intelligence and a profound sense of right and wrong. While he ignores traditional laws, he is acting more like McEachern’s Old Testament God or a New Testament Avenging Angel. His frustration, hatred, and violence are Biblical in proportion. Joe Christmas had character, one which was guided by moral principles – principles, in fact, which were more profound than any that Brooks describes. Yet he was never taught self-control. His vengeance was as swift and merciless as Jehovah. There was no room for consideration or negotiation. He grew up in a world of immorality and severe self-interest. He trusted no one, but no one with his past should ever be expected to. He had been so conditioned to mistrust others that his liaison with Joanna Burden is doomed from the start. The point is that few people living on the margins in America today have any of the characteristics that Brooks suggests. The inner-city ghetto is no different from the backwoods milieu of Lucas Walpole or the vengeful life of Joe Christmas. There is plenty of character in the impoverished neighborhoods of Anacostia, the Central Ward, or Delmar Boulevard. There are codes of honor, justice, courage, and integrity. The fact that they are inversions of middle class white norms is irrelevant. Success, stature, and social ascension are always – as Brooks rightly notes – functions of character and moral code. In the ghetto there is plenty of opportunity for advancement, many role models (Brooks’ exemplars), and certainly well-established standards. Low-level entry into the drug trade is easy and encouraged. Wealthy pimps, hustlers, and dope dealers are on every block. While these communities may have their own codes of character and opportunity; and certainly have established clear-cut standards of behavior and success, they are antithetical to the norm and no predictors of success in the larger world. The problem is that these communities are hermetically sealed – i.e. they are not exposed to majority standards of morality, good behavior, ambition, and opportunity. How can a young man from a bad block in a bad neighborhood with a highly developed anti-social structure, negative peer pressure, absent parents and authority figures other than those of the street ever even see the alternative let alone act upon its premise? This social insularity is not confined to the ghetto or to the backwoods. It is common everywhere. The working poor – those families who live on the margins and get by with minimum wage jobs, under-the-table salaries, no health care, unemployment insurance, and few economic opportunities – have plenty of character. They work hard (habits), but have none of the other three of Brooks’ criteria. Their opportunities are next to nil. In a state like Mississippi which ranks on the bottom of all socio-economic indicators, the chances of a low-wage waitress in a roadside kitchen ever doing anything else are slim at best. 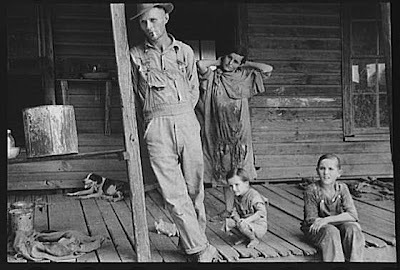 Those many black families surviving on welfare will remain on the public dole. Many poor blacks have no proof of birth or residency, are marginally literate at best, and survive from day to day. They have character, ambition, and intent; but will always be circumscribed by factors beyond their control. They, like Joe Christmas and Lucas Walpole were dealt a bad deck of cards and so did everyone in the neighborhood. I am all for discipline, enterprise, ambition, and above all character. I have written extensively ( http://www.uncleguidosfacts.com/2012/06/roman-educationlessons-in-leadership.html) about the value of a Roman education which prepared young nobles for service to the state; but which formed the basis for English tutelage. These young men were not only taught the three R’s but the importance of respect, discipline, courage, honor, and freedom – all in the interest of the common good. Individual desires were to be harnessed in the service of the many. Every advanced civilization has adopted these principles. The Enlightenment principles of our Republic were no different. Freedom and liberty did not mean a free-for-all, a bacchanal of individual pursuits and pleasure. “The pursuit of happiness” was presented in a distinctly moral and social context. The problem in poor communities is not lack of character or community norms and standards; but which norms and standards. Hermetically sealed, insulated communities, cut off for social, political, and historical reasons cannot help but adopting inverse standards. Character is universal, as is ambition, desire, and search for opportunity. Brooks underestimates the power and weight of social history, the confines of society, and the determinism of genes and deeply-rooted social behavior.